When I go my back to my everyday work (at the North Museum in Lancaster PA) I bring with me a couple of big hopes connected to this mission. For one.. I ‘m hoping to bring a temporary exhibit featuring seafloor science to our museum in the near future, and second.. I’m hoping we develop a new planetarium / outreach program related to the work of the Jason ROV on one part of this cruise that was particularly dramatic. Every educator aboard has developed plans to follow up on and make the most of this experience in the coming year. Who knows.. some of us may even be invited join another cruise in the future! 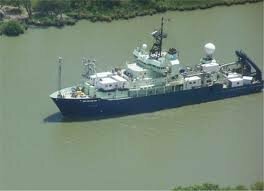 The scientists certainly have their hands full with all the data and samples collected on this very successful journey. They will be studying the results and publishing papers related to the discoveries, and planning out their next mission proposals. Thanks for following along on this blog and don’t forget to post your comments!